A creative way to learn about fractions by building a perfect fruit pie. Ideal to use in the classroom when learning about simple fractions. A colour and black and white version have been provided. In addition, a simplified version has been included for children with lower Numeracy levels. Select and download the colour or black and white version, at the required level. Provide the children with a yellow, blue, green, red and orange crayon. Ask the children to colour the whole pie in yellow to represent the custard. 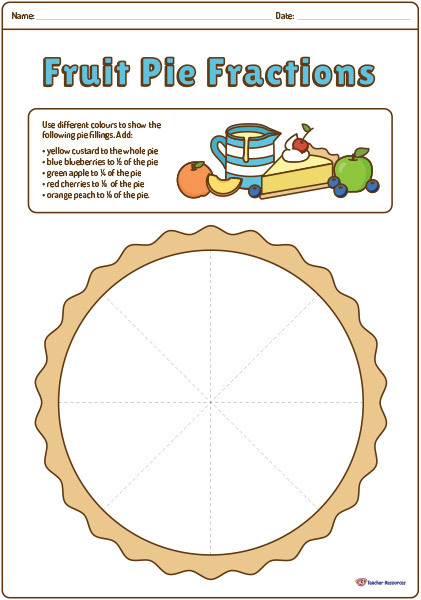 Ask the children to follow the directions and to add the different fillings to the given fractions of the pie. What comes next? – create a colourful classroom display.